Another youngster from France to make the list is Valentin Lavigne, a home grown rough diamond from Lorient’s academy. Lavigne saw 2014 as his breakthrough to the senior team, moving from Lorient’s B team at the start of the calendar year. He went on to make his debut again Monaco early this campaign and proceeded to score the winning goal 6 minutes after coming on for the Les Merlus. Mini-analysis: The first thing you notice Lavigne from an analytic sense is that he has the nack to be in the right place at the right him. This clubbed with his ability to finish off a move in a calm and composed fashion makes him very lethal. Lavigne is quick and intelligent in the way he finds spaces. He is often seen losing his marker and making himself available for a through ball from a team-mate. Predominantly right footed, you can immediately tell that his accuracy is noteworthy. Looking Back: While 2014 in general may have been his breakthrough year, this 2014/15 campaign in particular is where Lavigne is making all the right noises. So far, Sylvain Ripoll has placed trust in the youngster, giving him 12 chances to prove himself. In those 12 league appearances, Lavigne has found the back of the net thrice and contributed an assist as well (at the time of writing). For his age, having a minutes per goal stat of 135 is quite impressive. Ripoll has also handed Lavigne an appearance in the Coupe de la Ligue where he returned the faith invested in him by scoring a goal. Sandro Ramirez is a 19 year old Canary Islander who plays as a forward for FC Barcelona. He joined the Barcelona youth set up in 2009 as a 14 year old, progressing through the youth teams he became a Barcelona B regular in the summer of 2013, he finally made his first team debut coming on as a substitute in the 2014-15 season. Mini-Analysis: A man of powerful disposition Ramirez is a striker with exceptional goal scoring ability. 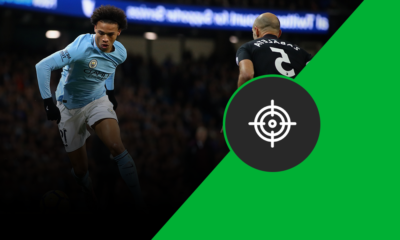 He is primarily a right footed striker in the mould of a traditional number 9, a classical poacher striker who stations himself on the edge of the offside line waiting to pounce on any opportunity to score with his powerful right foot. With Adama Traore given the role of the central striker by the Barca B manager – Eusebio, Ramirez has been played on the wings this season. Looking back: The shortage of forward players at the start of the current campaign saw Luis Enrique call Ramirez to the first team. During his brief stint with the senior side at the start of the season he made seven appearances, all of them as a substitute. He made the most of the limited chances that came his way, scoring the late winning goal on his first team debut in a tense match against Villareal. He also scored his first Champions League goal after coming off the bench against Ajax. This year also saw him make his Spain U21 debut. Franck Boli’s footballing roots are apparent; he is the son of former French footballer Basile Boli who played over 160 times for Marseille. Currently, Franck is making big strides in the Norwegian Premier League at Stabaek. The young lad has been with the senior team at the club since 2012 and has gone on to make over 80 league appearances, scoring 24 goals. Mini-analysis: Boli has many traits that are characteristic of a classic centre-forward. He is strong, powerful and good in the air. The youngster has a good leap, making his a significant aerial threat. Boli is blessed with pace and utilizes this well to get away from his marker and into open spaces. His first touch is commendable, making it much easier to work with him in tight spaces. 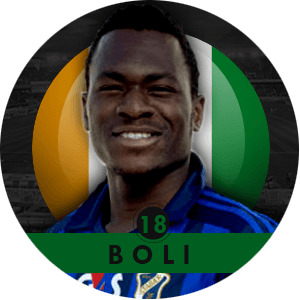 As for his shooting abilities, Boli is technical very sound and is capable of driving a powerful shot with his left foot despite it being the weaker of the two. Clubbing all these traits, one can see qualities that are very Drogba-esque. Boli is an intelligent footballer with good movement in and around the box; another quality that fits perfectly into the template of an ideal centre forward. Looking back: The 2014 calendar has seen Boli a total of 34 times, 28 in the Tippeligaen and 6 in the NM-Cup. In that time, Boli has managed an impressive 13 goals in the league accompanied by an assist and one goal in the NM-Cup. It is worth noting that of the 28 league appearances, all of them were as a part of the starting XI. 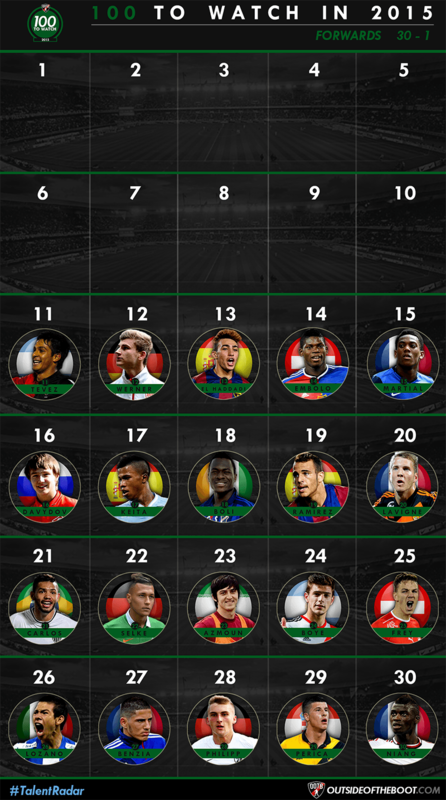 Match days 18 to 21 saw him score in four consecutive games. Balde Keita was a budding prospect learning his trade at the world famous La Masia in Spain before moving to Lazio in 2011 for about 3 million euros. In Italy, the Spaniard made a name for himself and got bumped up to the senior ranks. Keita has progressed steadily through him short career so far. There were rumours of Real Madrid and Manchester United showing interest in him. While that could pass off as speculation, it speaks volumes of the potential that people see in him. Mini-Analysis: Keita has quick feet and a lot of pace, enough to skip away from defenders and fall under the category for conventional wingers. Where he does differ from conventional wingers is that he is not afraid to cut in and drive. The youngster is comfortable with the ball at his feet and has an affinity for executing a trick or two, to get past people. Another noticeable trait is the ease and comfort with which he runs at defenders and dribble past them. 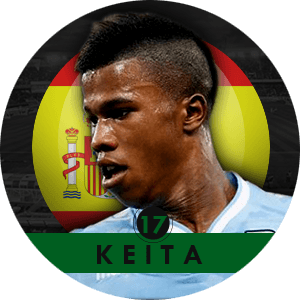 Like most Spanish players, Keita is capable of changing directions very quickly, which make it hard to defend against. Playing in the Serie A has taught him a thing or two about taking a tackle and staying strong. Looking back: This season has seen Keita spend a significant amount of time ruled out with a hamstring injury. His season is yet to take off but going by the potential we saw in him last season, that is going to happen sooner rather than later. The 13/14 season saw Keita appear 39 times in the Lazio outfit, resulting in a goal tally of 11 and 9 assists to add to that. 8 of those 39 appearances were in Europe, proving he can play with the big boys. He managed a goal and 4 assists in those 8 appearances. 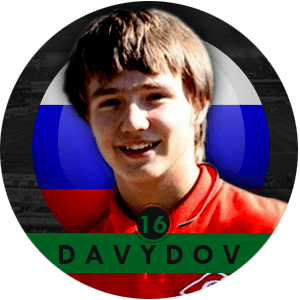 The Spartak Moscow man is the only Eastern European to feature in this 100 list of ours, and though the Russian Premier League in particular has failed to produce too many young stars and often offered false dawms, we have renewed hope in the ability of 19-year-old Denis Davydov. Mini-Analysis: Flair for the spectacular may be the best way to describe Denis Davydov. Though meant to play a central role as a striker, the youngster is prone to drifting into wider areas and always willing to have the ball at his feet. There’s a clear preference to take on opponents with grass ahead to run with the ball and though this has been effective, there’s a tendency to neglect off the ball movement. Displaying impeccable balance while in possession, the Russian is like a little live wire, dribbling his way through defence with incredible close control but quite often being let down in the final stage. Looking back: Though it has been over a year since his debut first-team appearance, Davydov has struggled to claim a place in the first-team squad. His ability isn’t in question, but unless chances are provided, his development won’t progress. 2014 was no different with a first team appearances followed by a drop to the bench or even an absence from the match day squad. Despite this inconsistent set of appearances, he received a call-up to the nation team but remains uncapped at senior level. His featuring as high as 16 is purely on the hope that he does get the chances, because on ability, he’s exciting to watch. 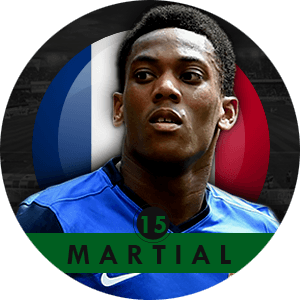 Throughout all the drama at Monaco since their return to Ligue 1 in 2013, a relatively rare shining light has been the steady progression of young striker Anthony Martial. So much has been expected and asked of from a player who let’s remember has only just turned 19. The fact he has remained so focus speaks volumes about his attitude in an era when many may have struggled. Mini-Analysis: Back in the summer of 2013 when Monaco were going spending crazy with the likes of Radamel Falcao, Joao Moutinho and James Rodriguez, the €5 million spent on young Lyon academy product Martial went relatively unnoticed outside of France. Those in the know however were aware that Monaco had purchased one of the most promising attacking talents in the country despite only having made a small number of appearances for Lyon. Combining pace and power the young Martial had been prolific throughout his progress in the youth teams. He infamously made his debut as a replacement for Falcao in an away trip to Nantes before going on to score his first goal for the club a week later. His ability to find space in the box means he is always a menace to opposing teams and is cool under pressure when in front of goal. You can find a detailed Scout Report on him here. Looking back: 2014 has been a year of two halves for Martial. The tail end of the 2013/2014 season saw him continue making sporadic appearances for the club as Falcao and then Dimitar Berbatov were above him in the pecking order. Since Leonardo Jardim took over in the summer, Martial has been more regular in his appearances, still however mainly used as a substitute, he has only missed three league games this season. As an example of his coolness in front of goal, his first goal of the season was perfect. Deep into injury time away to Paris Saint Germain and a goal down, Martial showed composure beyond his years to poke him after the ball broke to him. His relationship with Jardim has been fractious at times, most notably after he came on as a substitute against Nantes before being brought off 20 minutes later with no signs of injury. There is no doubt though that 2014 has been a year of progression for Martial. Missing school to go and play Liverpool at Anfield in a crunch Champions League tie? Sounds like any teenage football fan’s fantasy, but it is one that Basel’s Cameroonian 17-year old Breel Embolo has realized. The striker has enjoyed a dramatic rise from the youth set up to the first team in a matter of months, enthralling fans with his flair and youthful exuberance. Mini-Analysis: Blessed with power and pace, Breel Embolo has shown glimpses of his raw talent in his debut first-team season. Equally comfortable on the right as he is up front, the Cameroonian has displayed the ability to bully opposition defenders and torment them with his speed and dynamic movement. In addition to his impressive physical qualities, the teenager possesses flair and confidence; he is an exciting player who can get the crowd on their feet. Of course, as a striker his main job is to score goals, and the 17-year old has already reached double digits. He has the ability to score all kinds of goals, from audacious back heels to powerful rockets to cool finishes. Embolo is still a diamond in the rough: his finishing can still improve as he has wasted great opportunities at times. His game is very raw but there are undeniable signs of his enormous potential. You can find a detailed Scout Report on him here. 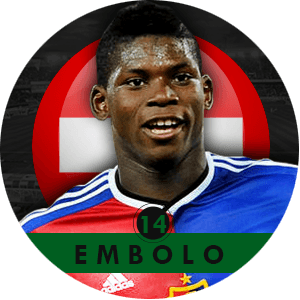 Looking back: After a senior debut in March, Embolo has quickly become a regular member of Basel’s first-team. Manager Paulo Sousa has thrown the teenager into the mixer from the off; he has started and played the full game in 11 of his appearances. Furthermore, he has already played the likes of Real Madrid and Liverpool in the Champions League and even scored against Ludogorets in a crucial win, making him the sixth youngest scorer in Champions League history. With 10 goals in all competitions this season, the Cameroonian, who has received Swiss citizenship and played for their U-21s, has been a menace up front for Basel this season. 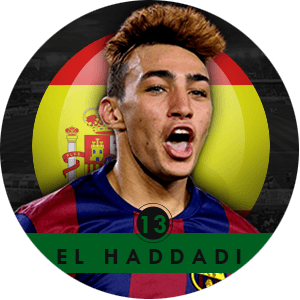 Munir El Haddadi is a Barcelona forward of Moroccan origin now a full-fledged Spanish international. He joined La Masia at the age of 16, and within three years went on to score for Barcelona first team on debut and getting his first international start for Spain. This year in particular has been nothing short of miraculous for him as he went from Juvenil A to the first team all within a span of just six months. Mini-Analysis: Strictly speaking Munir is a central striker, but since Messi occupies that role in the first team he has played on the wings. Starting from the wing he looks to dribble and cut inside to shoot with his strong left foot. For someone his age he has exceptional positional awareness and looks to feed off the through balls from midfield. Showing maturity beyond his years, he tracks back and fights for the ball with élan an aspect of the game that many players show disdain for. He still needs to work on his shot selection and not be wasteful with opportunities in front of the goal. Here’s a detailed Scout Report on Munir El Haddadi. Looking back: Neymar’s injury, Suarez’s suspension, and Deulofeu’s unexpected departure proved to be the perfect storm of events for Munir. It was a surprise for even the most dedicated of Barcelona followers to see Munir start and score in the first match of the season, a 3-0 win over Elche. A member of the Juvenil A at the start of the year he quickly progressed through the ranks and this same year made his Spain U19, U21, and first team debut. Such has been his rise that del Bosque didn’t take any chances and secured his services for Spain fearing overtures from Morocco. At 18 years of age, Stuttgart’s Timo Werner has been nothing less than a sweet surprise. He first burst on to the scene with Stuttgart in the Bundesliga with 4 goals and 4 assists in the first half of the previous season. And being a local lad (born less than a mile away from The Mercedes-Benz Arena), there was much affection and admiration pouring throughout Stuttgart. He is also the most exciting prospect to have emerged from Stuttgart since Mario Gomez (boy that seems really long, now). 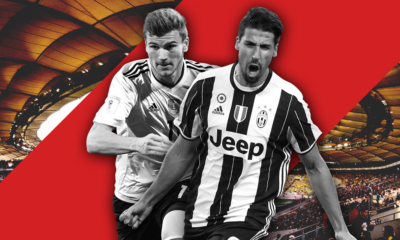 Mini-Analysis: Effective skills and tricks with the ball along with his pace had made him an integral part of Thomas Schneider’s Stuttgart though his preferred position is still playing as a central forward, where he has more of a chance to score goals. Been at Stuttgart since the tender age of 6 and has always been a prolific goal scorer throughout all the different youth ranks that he has made past to become a regular in the Stuttgart first team. His height is of slight disadvantage when he’s played out wide, but so far, he’s adapted to any attacking role just fine. He may not look like the strongest man on the pitch, but when on the ball he is very hard to be shaken off it. His game does remind most avid Bundesliga watchers of Thomas Muller when he first burst onto the scene at Bayern. 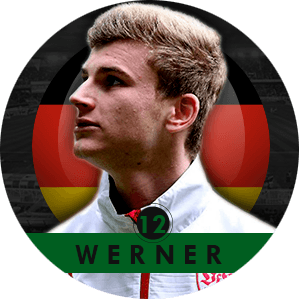 Looking back: Werner caused a few eyebrows to rise in the Stuttgart camp when he scored 24 goals in 23 appearances in the U-19 Bundesliga competition in 2012-13, which ultimately earned him his promotion to the first team squad. 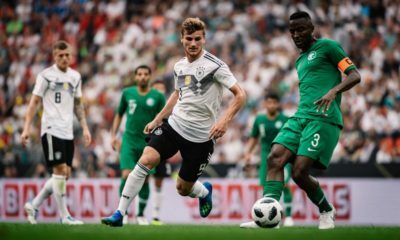 There were also rumours of Chelsea scouting the youngster but thankfully for the South-German outfit, Werner signed a contract extension early in 2014. Werner though did come out and say, he could never think of playing anywhere else, ever but it remains to be seen if the lack of Champions League football or even the Bundesliga will change his mind or not in the future. No relation to Juventus forward Carlos, Mauricio Tevez isn’t just generating plenty of interest because of his famous surname and has exploded onto the domestic scene in the last six months. Perhaps the breakthrough talent of the Torneo Transicion. Mini-Analysis: Pre-season all the hype surrounding Newell’s was on exciting striker Ezequiel Ponce but Tevez’s trickery and fearlessness have catapulted him into the limelight. Fleet of foot with a low centre of gravity and array of skills, Tevez loves to take on his man and not afraid to get to the byline to whip in a dangerous cross. He can cut in from the wing with great effect and has a dangerous shot on him too. He also gives his side great width by holding his position on the wing and stretching play. Obviously still a bit lightweight and not great in the air at 5ft 6” but makes up for this with his tenacity, energy and work rate. Has the feel of a street footballer who learnt his trade in one of the potreros of Rosario that have produced so many great players over the years. Looking Back: Tevez’s season began with a bang, scoring the winner on his debut for Newell’s against Boca Juniors away in the Bombonera. The similarity of his surname with a player who is idolised by Boca gave it an added dimension to what was a well taken strike for a rookie teenager. He showed it wasn’t just a one hit wonder with another winner against Estudiantes and went on to make 15 appearances, 12 of which were as a starter. In what was a pretty below par season for Newell’s, who 18 months ago won the title, Tevez has been a rare bright spark, along with fellow winger Maxi Rodriguez who has scored 11 goals this campaign. Indeed, Maxi would be a perfect role model for the Rosario-born teenager and playing alongside him can only be beneficial.